ICC Assessment can be taken to prove level of competence for many countries who now insist on the ICC for chartering abroad for at least one person on board. We offer a tailored package to get you up to the standard required for the ICC, and then carry out the practical assessment for you. The length of time this will take varies depending on your current skills and experience; sometimes we can do a day or 2 on your own boat, sometimes we recommend joining one of our 5 day practical courses. Rather than simply selling you the most expensive option available, we recommend you let us know your current skill level, and we can produce a plan to suit you. Some companies also specify the ICC as a minimum qualification for hiring boats abroad – often you are allowed a more powerful/larger craft if you have an ICC. We can also offer the CEVNI endorsement to the ICC, which is essential if you wish to travel the inland waterways. We can include training for this during our course, and the actual CEVNI exam itself is a short written paper. If you don’t wish to take any form of training course and just wish to come in for either the practical exam or the CEVNI, we can do this also. We are often able to carry out CEVNI tests midweek at very short notice. Lifejackets, Wet Weather Gear, Food, Drinks, Pillows. 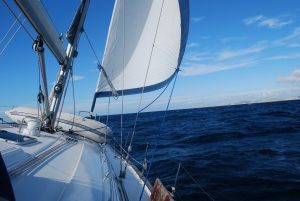 Aimed at complete beginners these two days provide a comfortable, relaxed and safe introduction to yacht sailing. The emphasis here is on having a fun time while experiencing this sport in a safe environment. We will cover skippering techniques for coastal & offshore passages, and takes Day Skipper skills much further. Over the 5 days you will cover some longer passages, carry out berthing in a wide range of conditions, cover the all important Man Overboard (MOB) procedures, and increase your night hours.